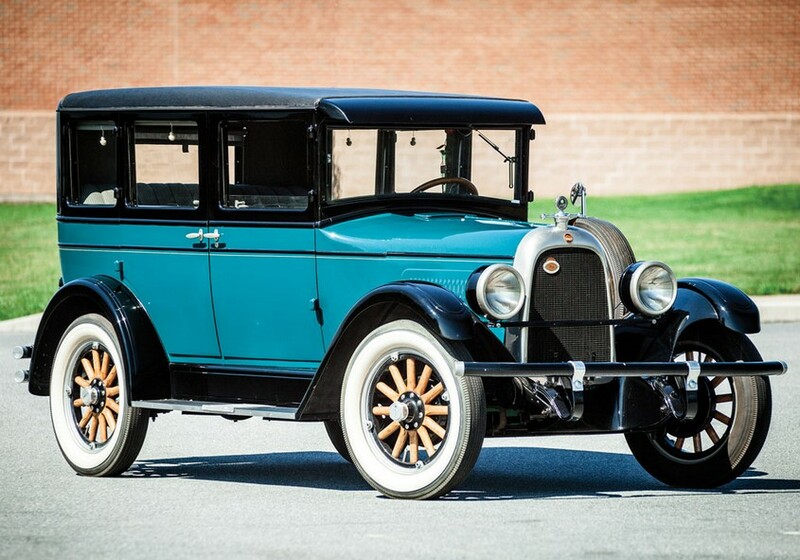 Oldsmobile became part of General Motors in 1908 and cars like this make it seem like the General left Olds alone for the first few years of their relationship. 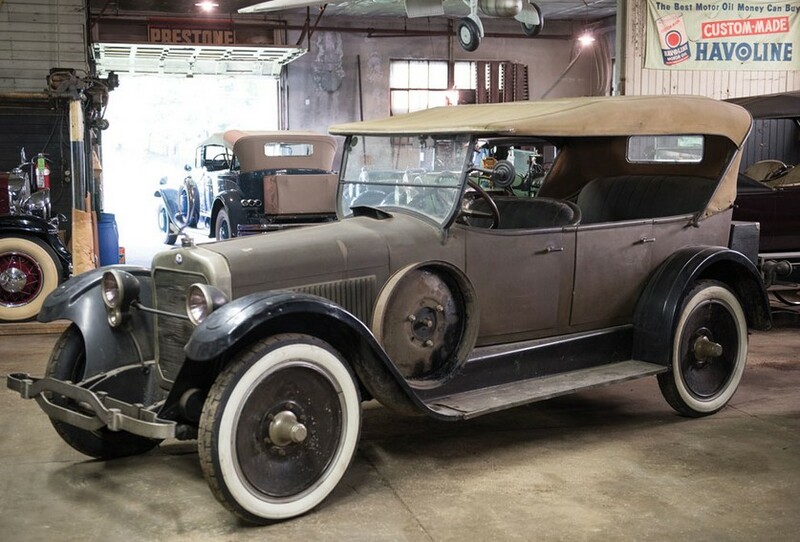 This does not look like a General Motors product, yet by 1913, Oldsmobile cars started to look more or less like everything else on the market. This Defender Speedster looks expensive and high-quality, not something from a company consumed with mass production. 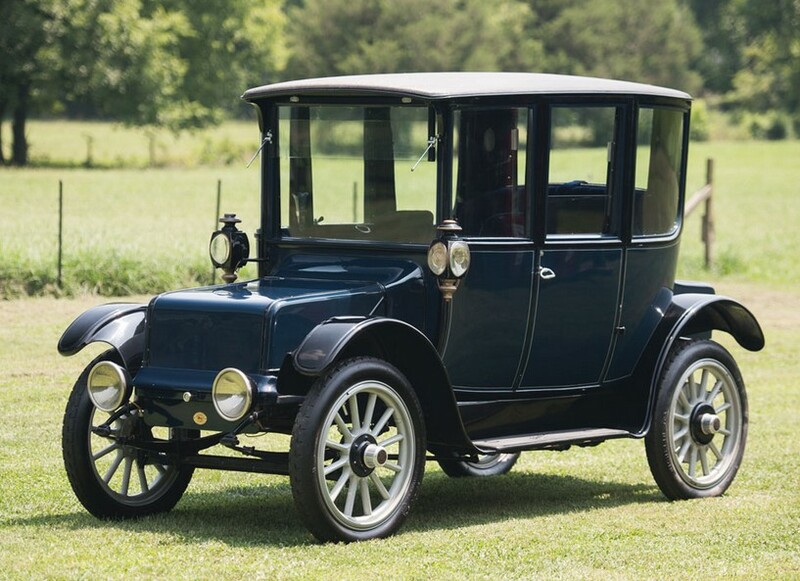 The 1912 Oldsmobile lineup consisted of this, the “small” Defender powered by a 35 horsepower, 4.4-liter straight-four, the mid-sized four-cylinder Autocrat, and the gargantuan Limited six. 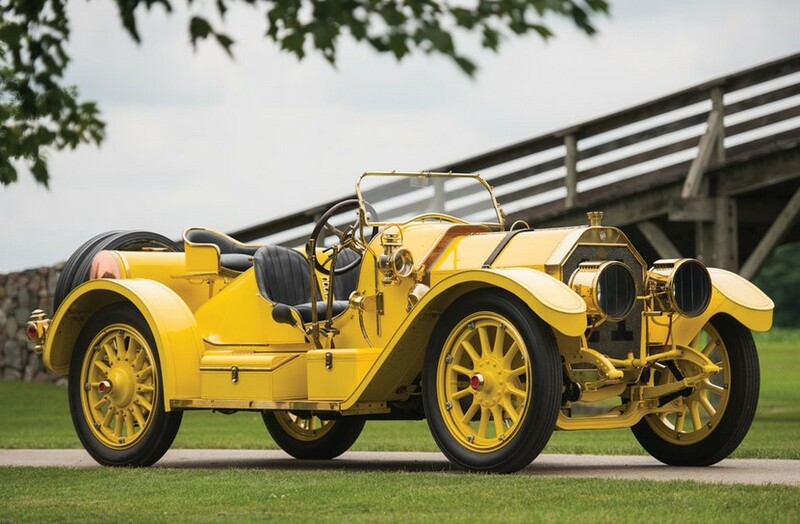 Open-top Defenders went for $3,000 in 1912, a pretty sizeable amount in its day. 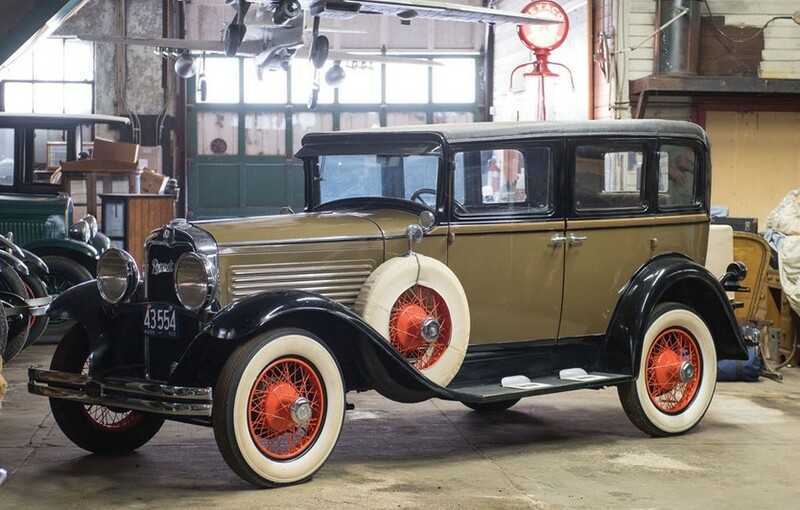 This well-restored car has been in the same collection for the last 12 years. It’s a rare model (only available in 1912 and 1913) seldom seen today. 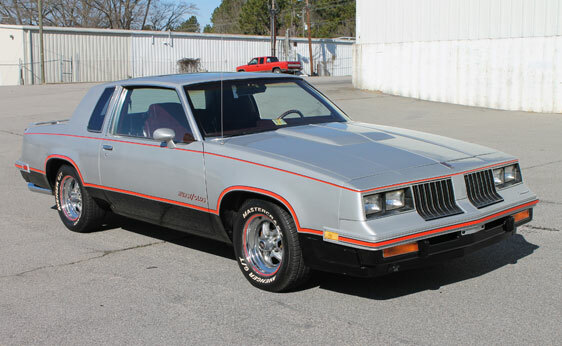 A great example of what Oldsmobile once stood for, it should bring decent money in Auburn. Click here for more info and here for more from this sale. Okay, so this is sort of a weird one, I’ll admit. The Oldsmobile Bravada is not a collectible car. Never has been, never will be. It was Oldsmobile’s only SUV they ever made as their unfortunate demise preceded the SUV explosion we’ve had of late. This is a second-generation Bravada (of three) and a platform mate of the Chevy Blazer and GMC Jimmy. The 1996-2001 Bravada was powered by a 4.3-liter V6 making 191 horsepower. This truck was actually used by the Indy Racing League as a support vehicle. 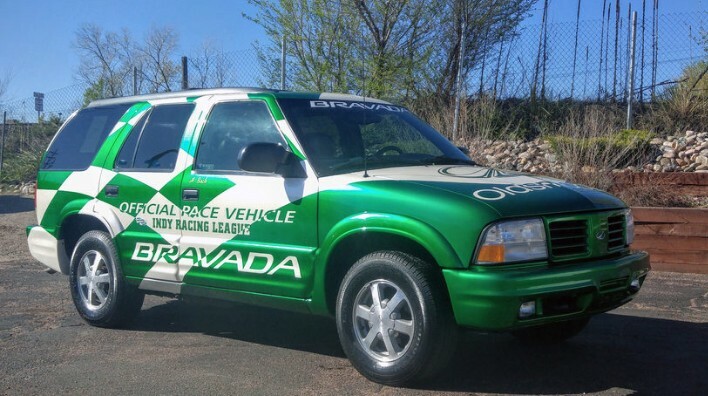 It says “Official Pace Vehicle” but it doesn’t have a lightbar, so it isn’t clear if it was used to pace races or to drive wrecked racers back to the infield care center. The graphics are kind of cool and you’d definitely have the coolest Bravada around. This was the first Bravada produced for the 1999 model year and it has covered only 10,926 miles since new. It is AWD and is really nice all around. It should bring a little more than your average used SUV. Click here for more info and here for more from this sale. Update: Not sold, high bid of $11,000. The Oldsmobile Autocrat was Oldsmobile’s mid-range model for 1911. At the bottom was the Special, but significantly upward was the Autocrat, which was second only to the legendary Oldsmobile Limited. This Autocrat was originally fitted with four-door Tourabout body work but its original (and long time) owner, John Henry Greenway Albert, fitted his own custom boattail aluminium body – which is what you see here. Albert owned the car from 1911 until 1968. 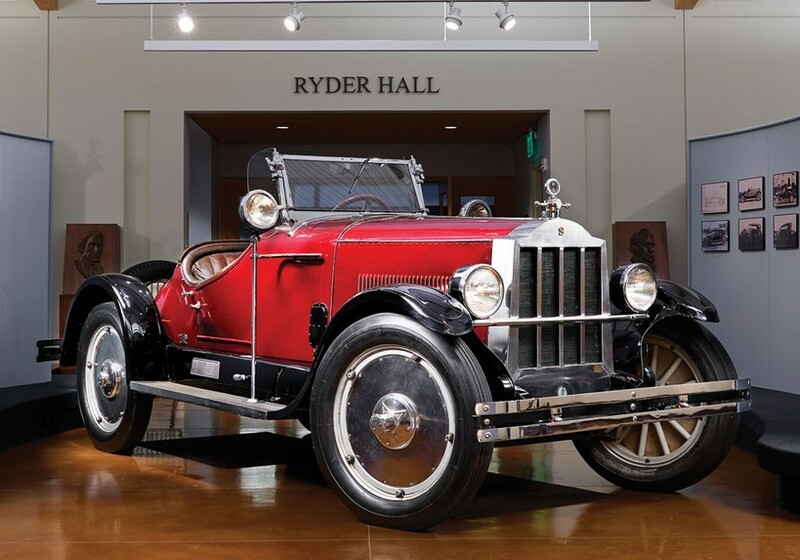 He drove the car – a lot, racing it on the East Coast and driving it back home out west – even years after more sophisticated cars had come onto the market. It is powered by a monstrous 40 horsepower 8.2-liter straight-four. The Autocrat was only built in 1911 and 1912. This example is an absolute driver, having been driven thousands of miles on tours and vintage races in the hands of its more recent owners. It’s been driven so much that it’s been restored three times. And it’s a looker too – kind of resembling something that, while a little more road-friendly, you may have seen at Indy in the early days. Click here for more info and here for more from RM. Update: Sold, RM Sotheby’s Monterey 2017, $605,000. This attractive Oldsmobile is a little different than the cars the company was famous for in its early years. The Curved Dash was Olds’ signature look in this era, but this Model N has what they called a “French Front” – a more traditional look styled after the cars coming out of France. Available only in 1904 and 1905, the Touring Runabout was powered by a seven horsepower, single-cylinder engine of 1.9-liters. It was more upscale than the Curved Dash, featuring an Oldsmobile first: a steering wheel! It cost $100 more, too, at $750. It was available in either this green or a dark red. Oldsmobile built 2,500 cars in 1904 between the Touring Runabout and a related model, the Light Tonneau. So rarity is guaranteed. This car was restored in the 1950s or 1960s by General Motors and remained in their Heritage Collection until 2011, so it has been well cared for. It’s a good-looking, early Oldsmobile. It should sell for between $65,000-$85,000. Click here for more info and here for more from Bonhams. We featured three cars from Bonhams September 8, 2012 sale held at the National Motor Museum in Beaulieu, Hampshire. The Waldron Wayfarer was withdrawn. 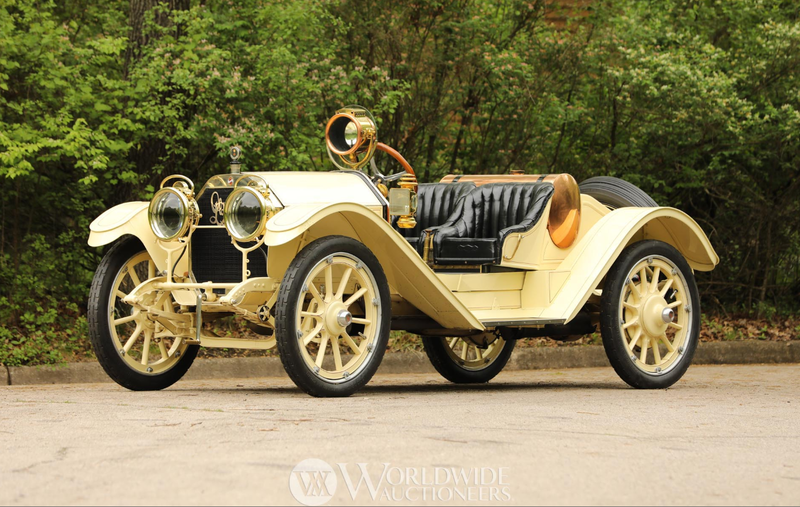 The Wolseley Seven sold for $18,774 and the 1913 Humberette brought $36,809. Top sale went to a 1925 Bentley 3/4.25-Litre Speed Model Red Label Tourer for $253,000. Right behind that was this 1927 Bugatti Type 40 Roadster for $239,000. There were a pair of interesting Delages at this auction, first: a 1913 Type R4 Two-Seat Raceabout (first below) for $68,000. And then a 1938 D6-70 Tourer with coachwork by Coachcraft. It (second below) sold for $82,800. Other cars of interest included this 1910 Star 15hp Tourer. This is from the British Star Motor Company – entirely separate from the American marque of the same name that operated during the same period. This big touring car brought $57,000. As far as oddball cars go, this 1958 Merry Olds Runabout is a 1950s replica of a Curved-Dash Oldsmobile from around 1902. There were a couple of companies that built such cars in the 1950s. This one was built by The Air Products Corporation of Ft. Lauderdale. These were not kit cars, but actual low-volume production cars with a throwback look. Now, why anyone would’ve wanted it for anything other than a novelty, I don’t know. I guess it would be nice to have the disposable income to buy a novelty car. It sold for $12,800. And finally, there was this amazingly-sporty 1935 Riley 1.5-Litre Kestrel. This thing looks mean. The low-slung drophead coupe body was custom built during restoration and no doubt looks better than the saloon body it replaced. It sold for $99,100. Auctions America recently offered a boatload of cars at their Ft. Lauderdale, Florida auction (seriously, it felt like it took forever to sift through the results). 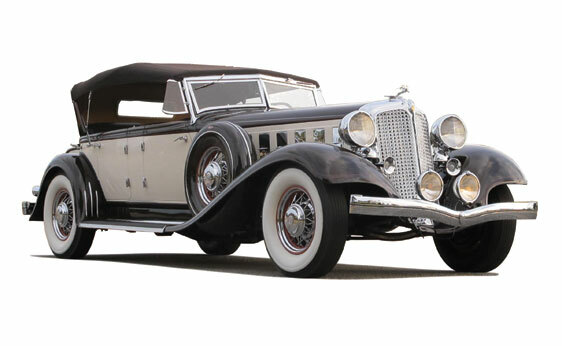 The top sale was $341,000 for this 1933 Chrysler CL Phaeton. It is one of only 36 built. 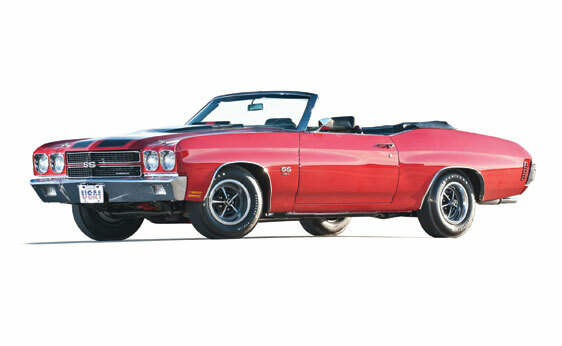 The second biggest sale went to a muscle car: a 1970 Chevrolet Chevelle SS LS6 Convertible. 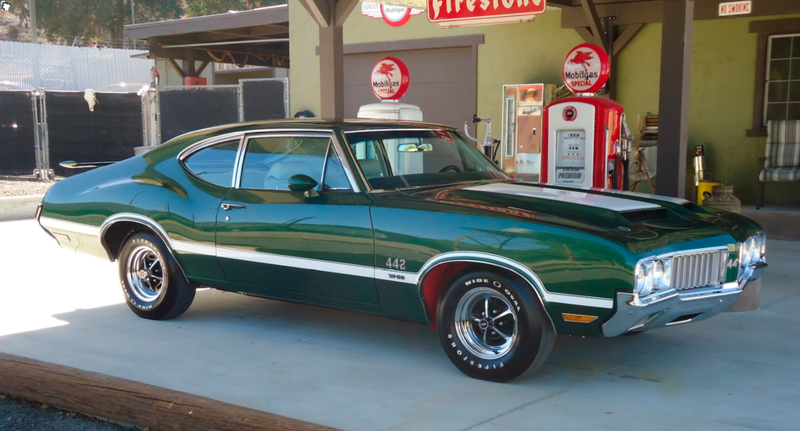 It’s one of the best looking muscle cars of the era and it’s equipped with the monster 454cid V8 underrated at 450 horsepower. It sold for $198,000. 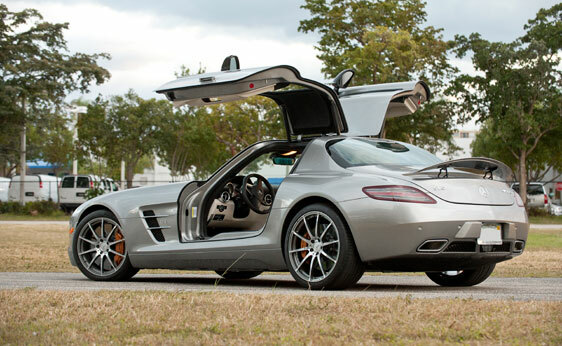 And the third biggest sale was a more-or-less brand new (391 miles) 2011 Mercedes-Benz SLS AMG. Off the lot examples are supposed to cost about $190,000. This one sold for $178,200. Basically, they just bought a new car. We featured a few really interesting cars from this sale including the 1959 Berkeley SE492 Twosome that ended up selling for $16,500. 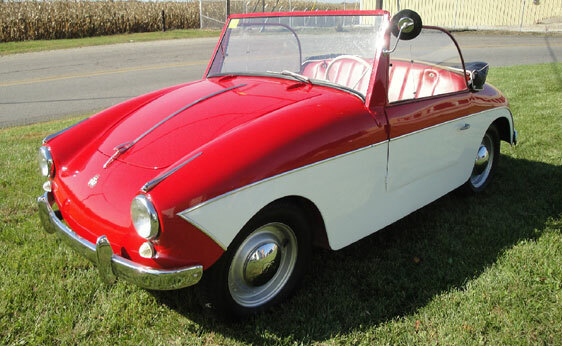 Another featured microcar was the 1957 David Convertible built in Spain. It sold for $25,300. And the final featured microcar was the tongue-twisting 1952 Kleinschnittger F125 Convertible that brought $44,000. There were two other very rare microcars at this sale that I was supposed to feature on the site but for whatever reason didn’t. First was this 1959 PTV 250 Convertible that brought $20,900. 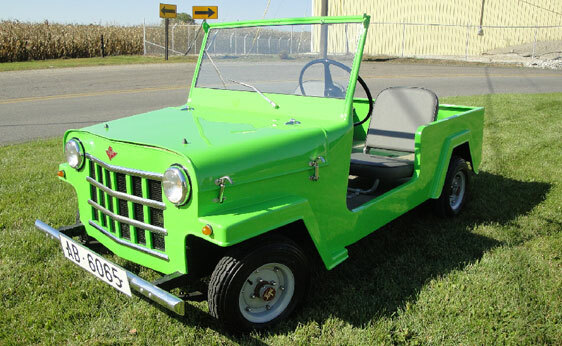 The other was this street-legal but spartan 1955 Kapi JIP Convertible for $8,500. 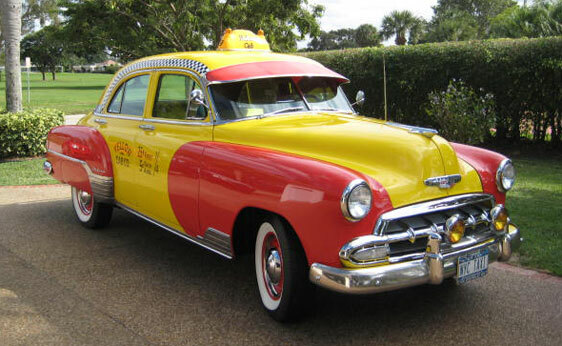 Other interesting lots included a 1952 Chevrolet Styleline done up in period-correct taxicab livery. It’s really sharp and sold for $36,300. 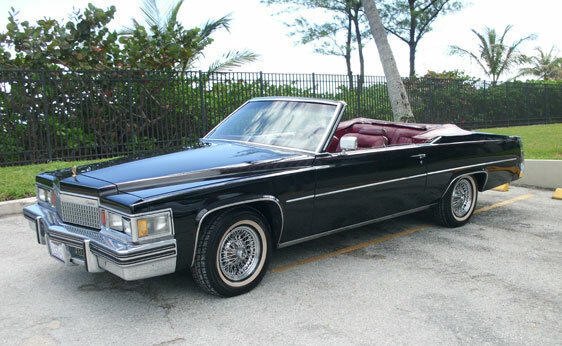 There were also some coachbuilt American cars from the 1970s and 1980s that included this 1979 Cadillac Le Cabriolet. It was 1 of 200 built by Hess & Eisenhardt for GM, as GM was still in their “no convertible” days. It looks good and could’ve been yours for $15,400. 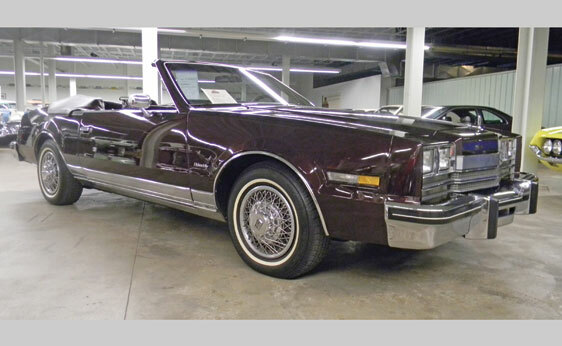 The other was a 1985 Oldsmobile Toronado Caliente Convertible converted by the American Sunroof Corporation (ASC), who appear to have built more aftermarket convertibles than most automotive companies did in the 1980s. It sold for $10,175. While we’re on the subject of Oldsmobiles, allow me to point out this 1984 Hurst/Olds. It isn’t exactly exotic, but I really like it and for $7,040, it’s quite affordable – which is the big draw to auctions like these where you can find yourself a real steal. 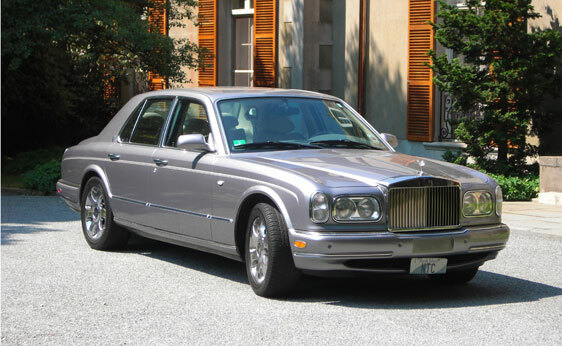 The other apparent steal that I would’ve liked to have snatched up was this 2000 Rolls-Royce Silver Seraph. They were only made from 1998 until 2002 and they cost over $220,000 when new. And now you could’ve bought one for $35,200! That’s 3-Series money! Maintenance nightmare waiting around the corner? Maybe. But it’s a small price to pay for rolling around town feeling like Jay-Z. The 1999 Shelby Durango we featured sold for $13,750 – which is about as cheap as you’re going to find something with Carroll Shelby’s name on it. 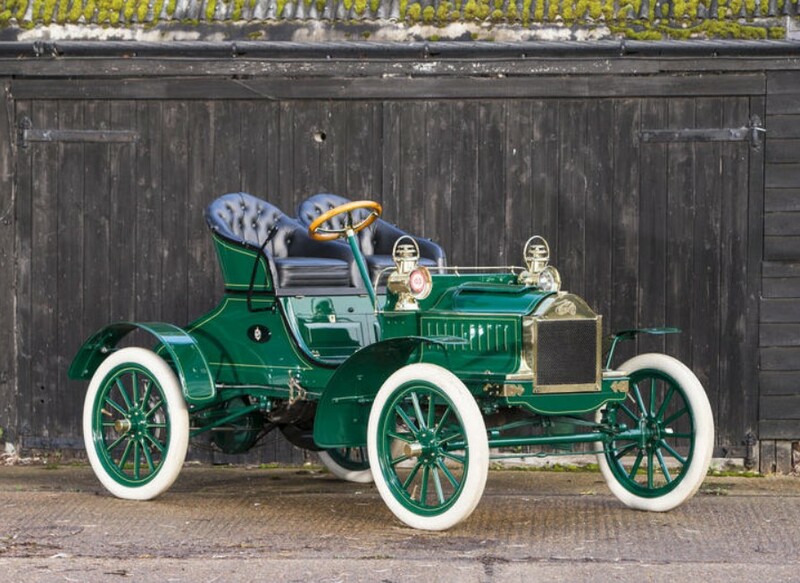 The 1912 Clement-Bayard Torpedo we featured was apparently withdrawn from the sale, as it is not listed as either sold or unsold in the auction results. For complete results, check out Auctions America’s website.